Seashells Broome (4.5 star) has been specifically designed to allow families and couples alike to indulge in the peace and tranquillity of this tropical paradise. Stylish, fully self-contained apartments and bungalows are nestled amongst lush and secluded gardens. 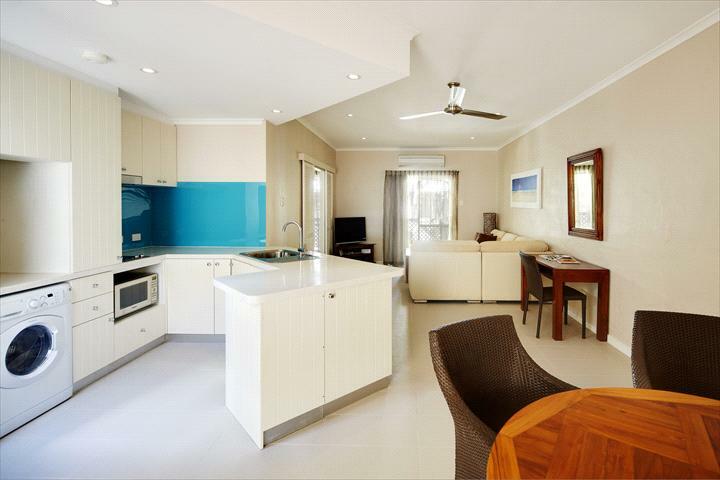 The resort is located just 300 metres from Cable Beach, and 5 minutes from Broome Airport. Relax in our tropical gardens with paved walkways or by the large outdoor heated/chilled island swimming pool with children’s paddling pool and sun lounges. Other facilities include barbeques, entertaining area, playground, small shop, tour desk and complimentary car parking. Choose from a selection of newly refurbished 1, 2 and 3 bedroom fully self contained apartments and bungalows. All feature well-appointed kitchens and laundries, spacious lounge and dining areas, with the 1 Bedroom Apartments also featuring a spa bath. Stylishly decorated with quality imported furnishings, tiled floors and timber balconies or verandahs, you’ll find every need is catered for. Enjoy Free Wi-Fi as well as free in-house movies, Foxtel, DVD players, air conditioning, ceiling fans, tea and coffee making facilities and a weekly housekeeping service (daily by request). King and single bedding configurations available. From the simple yet unforgettable experience of sunset watching at Cable Beach on warm tropical nights to sunset cruises, scenic flights and camel rides, our idyllic yet convenient location lies just minutes away from Broome town centre and a smorgasbord of activities and attractions. Also nearby is an exquisite pearl retail showroom and a variety of cafes, restaurants, shops and pubs. Once the pearling capital of the world, Broome has a romantic and often flamboyant past. Today Broome is perhaps most well known for its spectacular 22km stretch of white sand and sparkling blue sea, which is why Cable Beach is rated amongst the top beaches in the world. Winner of the 2004 & 2006 Western Australian Tourism Awards, in the category of "Deluxe Accommodation"
Winner of the 2003 Kimberley Tourism Awards, in the category of "Resort Accommodation"
Winner of the 2000 Kimberley Tourism Awards, for "Accommodation"
Winner of the 2000 Kimberley Tourism Awards, for "New Product Development"
Finalist in the 1999 Kimberley Business Enterprise Awards, for "Customer Service"
Finalist in the 1999 Western Australian Tourism Awards, in the category of "Tourist Development Projects"
Tastefully decorated with tiled floors, quality furnishings, spacious lounge and dining areas, verandah or balcony plus well-appointed kitchen and laundries. 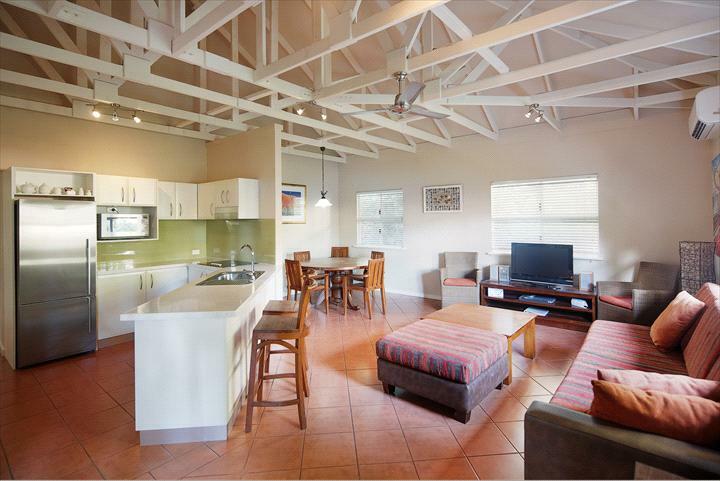 All feature free Wi-Fi, free in-house movies, foxtel, air-conditioning, ceiling fans, tea and coffee making facilities and a weekly housekeeping service. Ideally suited for couples, the 1 bedroom apartment has a large corner spa bath and king size bed. Cots are available free of charge for children under 2 years of age. Smoking is not permitted inside the apartments. The 2 bedroom apartments come with a king-sized bed and 2 single beds and are popular with small families. Cots are available free of charge for children under 2 years. Smoking is not permitted inside the apartments. Tastefully decorated with terracotta floors, quality furnishings, spacious lounge and dining areas, verandah plus well-appointed kitchen and laundries. Our spacious bungalows are suitable for either two couples or larger family groups, consisting of 2 bathrooms with 2 king and 2 single beds. Cots are available free of charge for children under 2 years. Smoking is not permitted inside the bungalows. Escape to Broome and stay in one of our recently refurbished one bedroom apartment with king size bed & spa bath FREE Wi-Fi, in-house movies and Foxtel + Bottle of Bubbly on arrival! 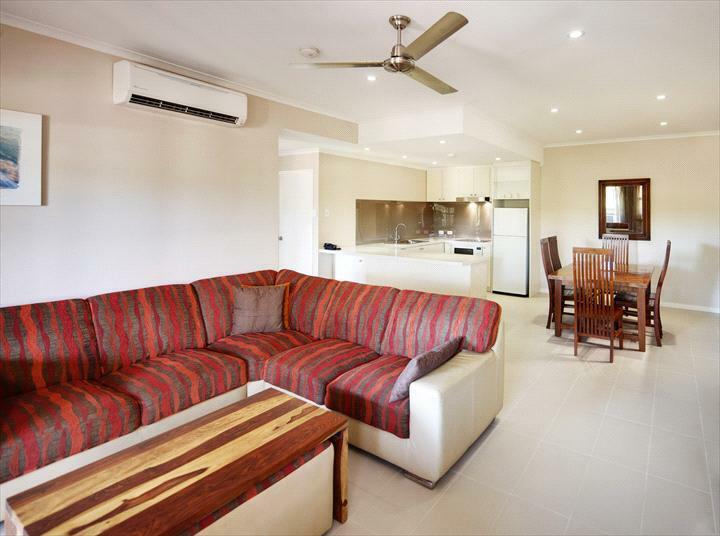 Escape to Broome and stay in one of our recently refurbished 2 bedroom apartment with king size and 2 single beds, featuring a spacious lounge, well appointed kitchen, air-conditioning, individual balcony or veranda. FREE Wi-Fi, in-house movies and Foxtel + Bottle of Bubbly on arrival! 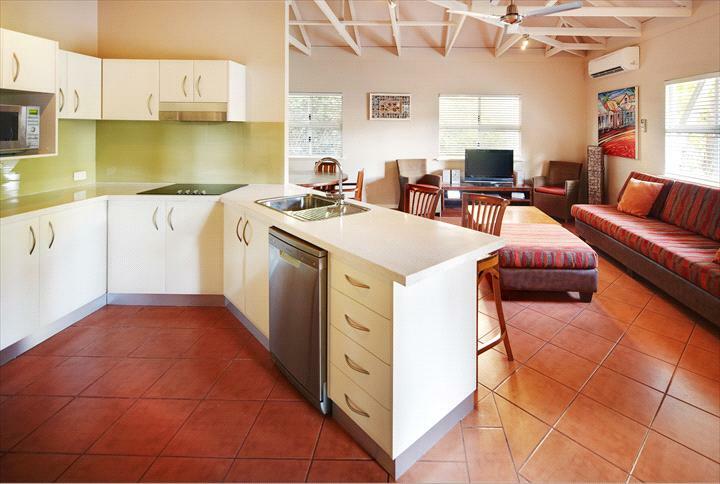 Escape to Broome and stay in one of our 3 bedroom, 2 bathroom bungalow with 2 king beds and 2 single beds, featuring a spacious lounge, well appointed kitchen, air-conditioning, verandah. FREE Wi-Fi, in-house movies and Foxtel + Bottle of Bubbly on arrival! All feature TV, free in-house movies, air-conditioning, ceiling fans, tea and coffee making facilities and a weekly housekeeping service. JULY AND AUGUST - Full payment is required 21 days prior to arrival. Bookings cancelled outside 21 days of arrival will be charged the cost of one nights accommodation. Bookings cancelled within 21 days of arrival are non-refundable and non-transferable. SEPT - JUNE Bookings cancelled within 21 days of arrival will be charged the cost of one nights accommodation. Bookings cancelled outside 21 days of arrival will incur a $50 administration fee.